During this month of awareness, we wanted to discuss the facts about domestic violence. We also want to make sure you know there are resources and support available to you (or someone you know) if domestic violence is occurring (or has occurred). If you or someone you know is a survivors, you can set up a free survivor account on MapYourVoice to tell your story and access resources and support specific to your local area. Survivors of all types of sexual violence, including those who have/are experiencing intimate partner violence (i.e. 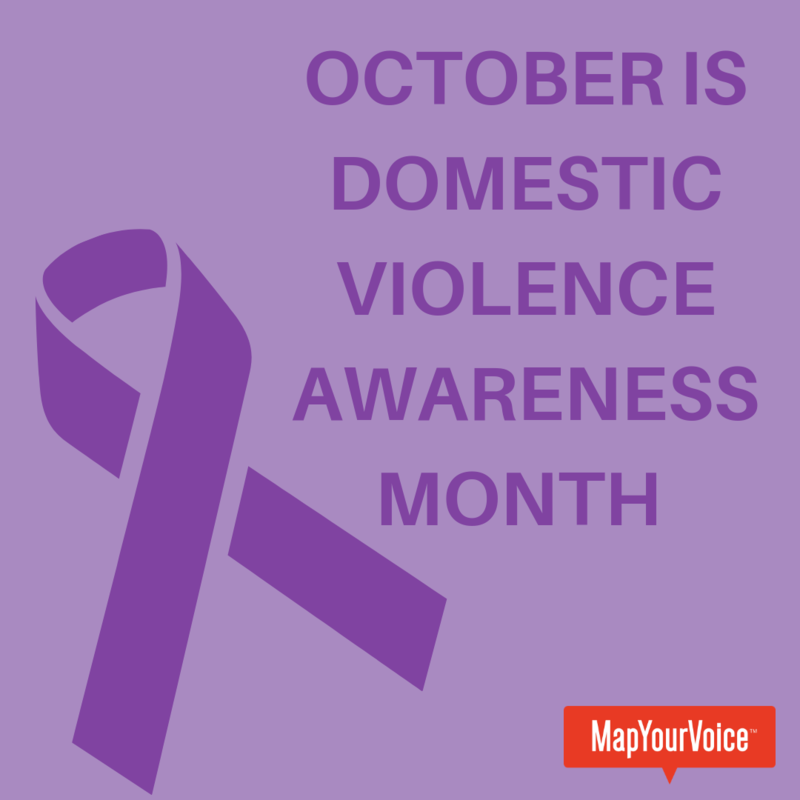 domestic violence) are receive the therapeutic benefit by having their voices heard on MapYourVoice in a safe and anonymous way. • In the United States, an estimated 10 million people experience domestic abuse annually. • Domestic violence is prevalent in every community and affects people of all socio-economic status, gender, race, and religion. This data was gather from a helpful research document produced by the National Coalition Against Domestic Violence. 1. VOLUNTEER: You can make a big difference by volunteering with organizations like ours or groups within your local community to help current and past victims of domestic violence. MapYourVoice offers many ways to Get Involved. 2. GIVE: When you make a tax deductible donation, you help non-profit organization like ours continue to provide essential services and support for survivors of domestic violence. * See NCADV Signs of Abuse for a comprehensive list. 4. OFFER ASSISTANCE: It is very common that victims of domestic violence needs assistance...sometimes multiple forms of it. From shelter services or police protection to financial assistance or counseling, survivors who break free of abusive relationships can have many needs. Supporting a survivor of domestic violence can mean helping to identify what kinds of support they might need and helping them contact those services within their local area. They may need a safe place to stay, or a private phone or computer to use (where they are not being monitored by the abuser). You might offer to call the police and stay with them until authorities arrive. If they do not want to involve the police, you can offer your phone for them to call a friend or family member. 4. EDUCATE YOURSELF: While it is important to not be a silent bystander, it is also important to know the risks of intervening in a situation with an abusive individual. In general, an abusive person wants to maintain control and doesn't want anyone else to intervene in a way that could empower the person they are abusing. Be aware that one of the most dangerous times for a survivor of domestic violence can be directly after they leave the abusive relationship. Educating yourself to recognize the signs of domestic violence as well as the best ways to safely and successfully intervene if you suspect it is occurring. 5. PASS IT ON! Share this blog post with your family, friends, and co-workers so more people are informed, and together, we can take steps to stop domestic violence. Also check out our blog post on 10 ways to support survivors to learn how best to support survivors of sexual assault and abuse. Join our global Action Network to state up-to-date with MapYourVoice.